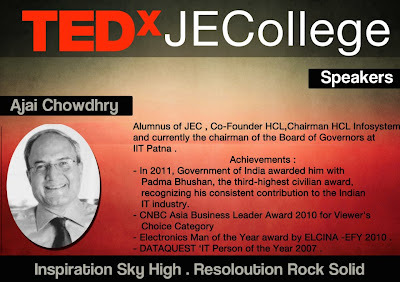 As I already Mentioned about TEDxJECollege in previous post. But today I will share some more info about it. 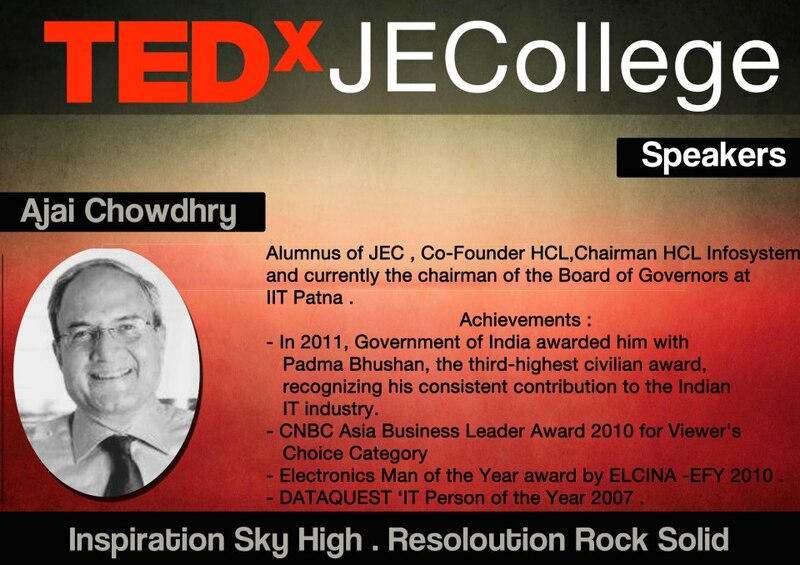 Finally TEDxJECollege Speakers List is revealing day by day and I am too Excited about this Event. *Correction International Experience. Just 1 Word that can describe his personality is “Legend”. Yes I am Talking about The Founder of HCL. An engineer by training, Ajai Chowdhry is one of the six founder members of HCL, India's leading Technology and IT Enterprise. HCL, India's original IT garage start-up founded in 1976, is today a US$ 6.2 billion Global Enterprise. Ajai took over the reins of HCL Infosystems, the flagship company of the group, as President and CEO in 1994. He was appointed the Chairman of HCL Infosystems in November 1999. Under Ajai's stewardship, the company's turnover has grown to US$ 2.7 billion for the last 12 months from US$ 89 Million in 1994. Employing ~6100 people, it has emerged as the country's information-enabling powerhouse. Ajai has been a key force in driving the growth of HCL Infosystems. The credit of setting up HCL's overseas operations, starting with Singapore in 1980 goes to him. During this tenure he extensively covered South Asian Markets including Malaysia, Thailand, Hong Kong, Indonesia, and the People's Republic of China, expanding business operations, which paved the way towards enhancing HCL's core competencies in bringing the best international technologies to the domestic market.